Looking for a fantastic festive event that’s packed with fun, activity and excitement? 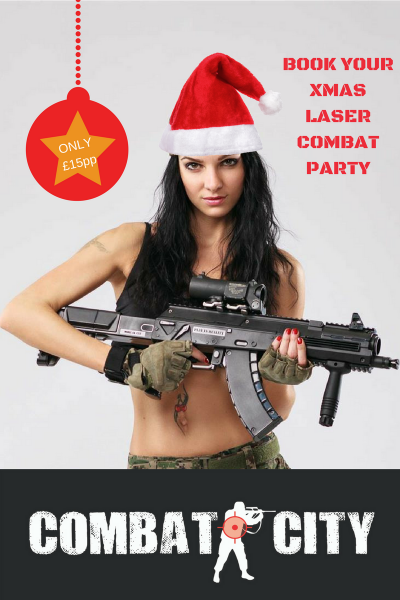 Whether you are organising a night out for a Youth Group, Sports Club or action packed Office/Works Christmas Night Out in Glasgow or Dundee, nothing beats 2 teams battling it out at Combat City. Its thrills, spills and laughs all the way as you battle it out to dominate the arena in a urban warfare setting that’s guaranteed to make this the last word in shoot ‘em up experiences. 9. Adult groups are welcome to bring some wine and beer to celebrate their victories and losses! Minimum numbers for a party package are 8, all battles are open play, unless exclusive use is paid for. NB The Glasgow arena can be booked 7 days a week, this offer is not available on Saturday afternoons, when we run a longer 90 minute game for only £22pp including catering. The arena offers a unique inside/outside experience, please dress for the weather. The Dundee arena is open every day apart from Tuesday. It’s a big warehouse which can be chilly, so please dress accordingly, though you soon warm up!